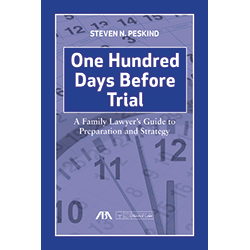 One Hundred Days Before Trial provides an antidote to trial anxiety, usually caused by poor planning and insecurity. The author offers an alternative to the mad-dash scramble model of trial preparation, with a simple message: start early with the end in mind, develop a plan, and maintain self-discipline to work the plan on a regular basis. The book is broken into segments based upon arbitrary time periods. The reader need not precisely follow the schedules suggested; they are simply guidelines to consider. Each case is different and one must prepare according to each case’s dynamics. What is essential and common to all cases, however, is the necessity of thinking first, acting second and being mindful both of the big picture and the fine details.